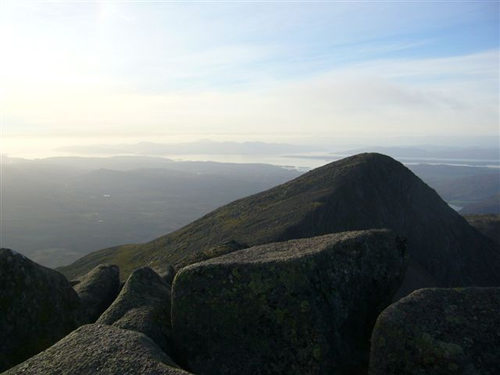 Ben Cruachan (Gaelic: Cruach na Beinne) consists of a long rocky ridge. Along this ridge there are two peaks ranked as Munros, Ben Cruachan and Stob Diamh and a Corbett, Beinn a' Bhuiridh which make up the Cruachan horseshoe surround the power station reservoir. The ascent of Ben Cruachan is steep but straightforward and similarly so the traverse to Stob Diamh. 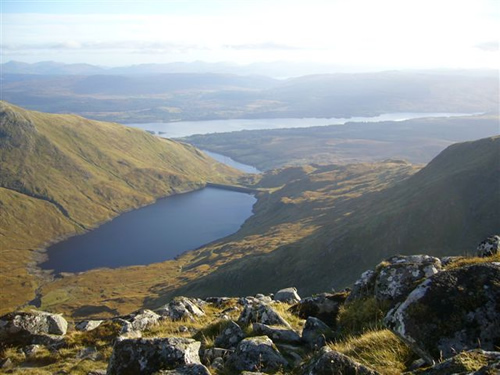 This circular hill walk starts at the layby on A85 near Falls of Cruachan railway station. Follow the path up and through the tunnel under the railway line and then to the left and climb up a woodland path over rocks and tree roots emerging into a somewhat boggy area leading up to the Cruachan dam. Follow the road to the right of the reservoir then pick your way carefully across boggy grassland up towards the initial peak of Stob Garbh (980m) then along and up to Stob Daimh (998m). This is a good lunch stop with great views down to the reservoir, Loch Awe and Loch Etive and the Horseshoe. Then head left down then along the ridge then an easy scramble up rock slabs to Drochaid Ghlas (1009m). Keep scrambling left along and up to Ben Cruachan itself (1126m). 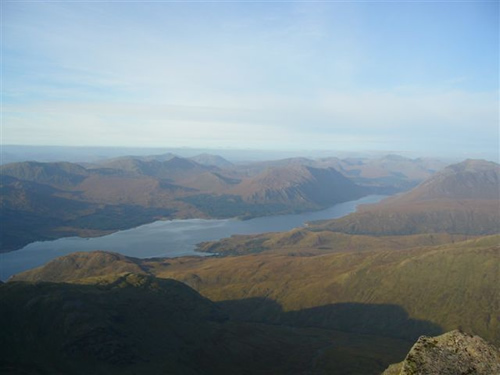 Great views out over ArdnaMurchan and Mull from the top. Return by heading directly down the rock slabs towards Meall Cuanail but cross a fence left into Coire Dearg and follow a boggy path of sorts to the left of a burn leading down into the reservoir. Eventually you reach the track down the side of the reservoir and then climb down a ladder and steps past the dam and over to the way you came up earlier to find the path down through the woodland and under the rail tunnel back to the layby. This was in fine sunny weather and took 7.5 hours (2.5 hours being back from the top of Ben Cruachan). A torch could be useful to have for the descent through the woods and the tunnel in case it is getting dark by then!